We believe in educated choices. Reducing our use of animals whenever it is possible is a very positive attitude. The practice of fur factory farming is a practice of the past that has been banned in 10 countries. Thanks to fur bans and innovations in the field of faux fur, 20% less animals have been exploited in 2018. All the brands switching from animal-based to faux fur have saved millions of animals. Putting ethical aside we should not idealize fur farming. Intensive farming does come with an environmental cost. From farm animals to processing and maintaining fur, the environmental costs are quite considerable. From a neutral perspective - land use, water use, chemical use, energy use is what we need to consider if a material is eco-friendly or not. If we look at the Industrial Pollution Projection System we will see that tanning and leather, wearing apparel and fur dressing are pretty close to each other. That's precisely why "Life Cycle Assessment" studies are important. Expert group of the CE Delft, a bureau of experts known for their reliability, conducted a LCA on mink fur and faux fur. They examined manufacturing, cold storage, cleaning and life of the garments finding that faux fur is almost five times greener than mink. 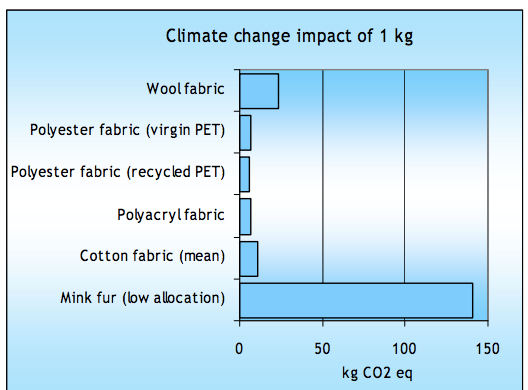 The overall conclusions of the LCA were : compared with other textiles, fur has a higher impact on the environment per kg in 17 of the 18 environmental categories, including climate change, eutrophication and toxic emissions. To analyze fur impacts we need to look at the impacts of fur farming, processing, storage, and post-consumer phase. "A pelting plant is not complete without a storeroom in which temperature can be kept between 10 and 12 degrees C... and the humidity at about 70/80 per cent" says the Danish Fur Breeder's Association. "The whole process and the whole fur industry are entirely predicated on that great environmental foe, fossil fuel", recalled eco-expert Lucy siegle. It is crucial to consider the overall context : We don't leave yet in a petroleum-free world. Everything around us is made out of oil and polyester used for the production of faux fur is a by-product of the transport industry. While this resource is still widely used it remains logical to use it. Producing the same coat with a reduced impact on climate change is what eco efficiency is about. According to the 2017 Copenhagen Fashion summit’s Pulse of the Fashion Industry report, the fashion industry is responsible for the emission of 1,715 million tons of CO2 in 2015. The 2018 climate Works report put the fashion industry at 8% of global greenhouse gas emissions. Yet we know, that the climate impact of faux fur coat is 4 to 7 times smaller in terms of CO2 emissions, than that of mink fur. Fur processing is a big business in Asia where regulations are lax. The process involves chemicals and dyes manufactured by the petro-chemical industry. The ingredients used are volatile components. Left : image of a river near Hebei polluted by industrial waste dumped by the fur processing industry. If there's got to be fur and if we take into account today's context, it remains smarter to utilize what already exists on a large scale, a byproduct, and create a life-friendly fabric, than to absurdly farm 150 millions animals per year, feed and water them, wasting considerable amount of natural resources and finally process the pelts with chemicals. This is the key concept of eco-efficiency. Faux fur is a smart choice totally in line with a sustainability plan any luxury brand wants to set-up. Simultaneously, the faux fur sector is investigating and investing in sustainability initiatives. Textile experts are creating the transition from oil-based products to bio-fabricated products. Supporting a transition to clean energy. From improved recycling to the use of plant based ingredients to shrink our environmental footprint, a new generation of synthetics is expected. There is always something clever to do with an old faux fur coat. Faux can be reused to create cushions, rugs, or to customize other garments. An old faux fur coat can be given to a local shelter. Customers can also contact the label and participate to their recovery / recycling service. Even if a 2 degrees Celsius limit global temperature rise is successful, or even if the reduction in carbon emissions happen, it will merely delay catastrophic climate change, not prevent it. We absolutely need to pursue an all-of-the-above approach that utilizes every strategy to decarbonize. The most simple and efficient way to decarbonize our atmosphere is to plant trees. Planting trilions of trees could cancel out a decade of CO2 emissions claims a new study published in Nature. Approprietely, more and more companies are involved in forests restauration campaigns. Other ideas include a cohort of technologies that pull carbon dioxide from smokestacks, or from the air, and convert it into useful materials or store it underground. CCUS technology can zero out the carbon emissions from fossil fuels and remove previous emissions directly from the atmosphere.